WHAT: In conjunction with shorter days and Daylight Savings time, the Bike Coalition invited two-wheeled travelers to collect free bike lights and important safety information about riding in the dark. WHY: With the Daylight Savings transition on November 6, bike commuters will soon find themselves pedaling to and from work when the sun has gone down. With proper bike lights, all two-wheeled travelers can ride safely, remain visible to others sharing the roads and follow the state law, which mandates front and rear lights when pedaling in the dark. San Diego County Bike Coalition (SDCBC) is a nonprofit organization that advocates for and protects the rights of all people who ride bicycles. They promote bicycling as a mainstream, safe and enjoyable form of transportation and recreation. 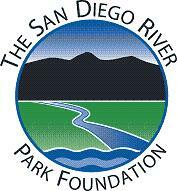 For more information, please visit http://www.sdbikecoalition.org. Bring your friends! Bring your family! Bring your bike! 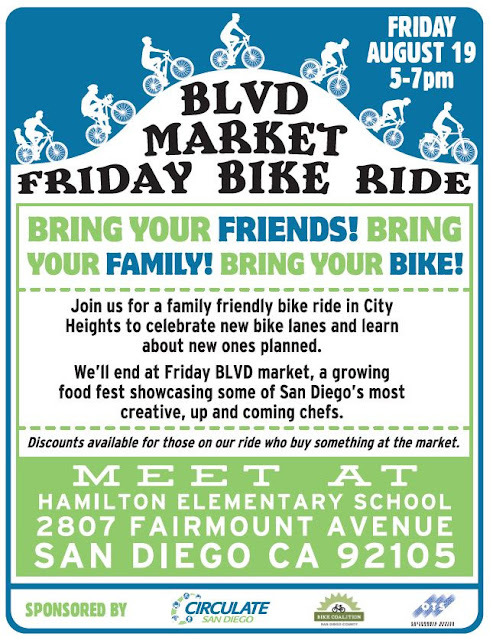 Join Circulate SD and the Bike Coalition for a family friendly bike ride in City Heights to celebrate new bike lanes and learn about new ones planned. It will end at Friday BLVD market, a growing food fest showcasing some of San Diego's most creative, up and coming chefs. Discounts available for those on our ride who buy something at the market. The group will end the evening riding back together. Bike Coalition Applauds Approval of Downtown Mobility Plan Plan to significantly improve quality of life in downtown San Diego SAN DIEGO, June 21, 2016 – Today, San Diego City Council approved a precedent-setting initiative for improving quality of life in downtown San Diego: The downtown mobility plan. The plan aims to address rapid downtown growth by implementing a cohesive network of bicycle and pedestrian infrastructure to connect downtown San Diego with its surrounding neighborhoods and encourage more biking and walking in place of driving cars. The San Diego County Bike Coalition, an organization advocating for and protecting the rights of all people who ride bicycles, applauds City Council’s commitment to taking the initiatives to make San Diego a world-class city that addresses its anticipated growth and air pollution issues with contemporary solutions. “The health of our region depends on decreasing the use of cars and giving residents the opportunity to choose life on two wheels – and feeling safe while doing so is the key,”says Andy Hanshaw, executive director of the Bike Coalition. “With 90,000 people expected to live downtown by the year 2030, our city desperately needs this long-term solution for increasing mobility without increasing car use.” The downtown mobility plan supports the City of San Diego’s climate action plan -- which calls for increasing the number of people commuting by bike from one percent to 18 percent by the year 2035 -- as well as federal air-quality standards and state-mandated greenhouse gas emission reduction goals. According to Hanshaw, the key to reaching these well-intentioned goals is to build better bike infrastructure that makes anyone choosing two-wheeled travel feel safe. With today’s approval, the City plans to incorporate the downtown mobility plan into its budget – a process Hanshaw and local bike commuters hope to see move quickly to get San Diego rolling on its path toward becoming a modernized transportation city nationwide. For more information on the San Diego Bike Coalition and making San Diego a better place to ride bikes, please visit www.sdbikecoalition.org. ### San Diego County Bike Coalition is a nonprofit organization that advocates for and protects the rights of all people who ride bicycles. They promote bicycling as a mainstream, safe and enjoyable form of transportation and recreation. For more information, please visit www.sdbikecoalition.org. Bike Coalition To Lead Rolling Rally Supporting Downtown Mobility Plan City Council decision could improve local quality of life for all people WHAT: Bikes will roll from the new Horton Plaza Park to San Diego City Council with a purpose: to support the long-overdue bicycle improvements proposed in the Downtown Mobility Plan. The first-of-its-kind plan includes a connected series of bike lanes with physical barriers to separate riders from traffic and transform downtown into a place for all people to get around – in and out of cars. The San Diego County Bike Coalition will lead a ride and rally in support of the plan immediately preceding its City Council consideration. WHY: The Downtown Mobility Plan addresses the transportation and parking issues of a rapidly expanding downtown area by providing safe options for more people to travel without a car. If passed, the bike network will support the City in meeting its climate action plan goals as well as federal air quality standards and state-mandated greenhouse gas emission reduction goals. According to the Bike Coalition, the health of our region depends on decreasing the use of cars and giving residents the opportunity to choose life on two wheels – and feeling safe while doing so is the key. WHEN & WHERE: Tuesday, June 21 Noon: Bike riders meet at Horton Plaza Park (900 4th Avenue) 12:30 p.m. – 1 p.m.: Bike ride departs from Horton Plaza Park to San Diego City Council 1 p.m.: Rally outside San Diego City Council 2 p.m.: San Diego City Council hearing begins WHO: San Diego County Bike Coalition Supporting local bike groups People passionate about making downtown San Diego a bike-friendly place For more information on bicycle initiatives, please visit www.sdbikecoalition.org. For additional statistics on the positive impacts of bike infrastructure in popular U.S. cities, click here. ### San Diego County Bike Coalition is a nonprofit organization that advocates for and protects the rights of all people who ride bicycles. They promote bicycling as a mainstream, safe and enjoyable form of transportation and recreation. For more information, please visit www.sdbikecoalition.org.